Experts criticized the federal government committee currently crafting the nation’s dietary guidelines as politically motivated and said it was putting environmentalism over food science. The Hudson Institute hosted a panel discussion on the Dietary Guidelines Advisory Committee (DGAC) on Capitol Hill Thursday, analyzing the incorporation of climate change and "sustainability" into the recommendations that are used to set standards for government food programs. In meetings earlier this year the committee has encouraged Americans to move to a more "plant-based" diet out of concerns for the planet, and emphasized behavioral change as a means to get obese individuals to lose weight. The DGAC has been working on the 2015 guidelines for over a year and is mandated by Congress to modify their recommendations every five years. "To me, this is an example of when you have a hammer everything looks like a nail," said Hanns Kuttner, a senior fellow at the Hudson Institute, regarding the committee’s delving into issues unrelated to food policy like environmentalism, immigration, and animal rights. "The committee is not considering the best available science," said Julie Gunlock, who directs the Culture of Alarmism Project at the Independent Women's Forum. "This is particularly worrisome considering that people will be told to eat a certain way not because the scientific and medical data suggests it’s a better way to eat, but because of environmental and other non-dietary reasons." Gunlock said the committee has placed an emphasis on eating organic food, but has neglected to mention studies that have shown no health benefits over conventional foods. "The committee members seemed utterly immune to the realities of life, that there remains an unemployment problem in this country, that families continue to face budget pressures, and most importantly, food prices are rising thanks largely to drought, disease, and strong demand," she said, noting that organic food is more expensive. Tevi Troy, an adjunct Fellow at the Hudson Institute and president of the American Health Policy Institute, said sustainability is a "costly fad," and gave his advice to the committee: "keep it simple, stupid." "It really shouldn’t be that hard to come up with general parameters for dietary guidelines that don’t overtax the mind and overtax the budget," Troy said. "I’m going off the top of my head here, but limit portions, eat more green rather than white, and when I say green I don’t mean mint ice cream. Fresh food rather than processed to the extent possible." "I think if we took an approach like that it would be wiser, more likely to be listened to, and much better than 400 pages of faddish, semi-scientific material," he said. Though the guidelines, which are overseen by the Department of Health and Human Services (HHS) and the Department of Agriculture (USDA), are not binding by law, agencies are required to use them when crafting policy. They also influence school lunch and breakfast programs and what is served in military mess halls. Rep. Reid Ribble (R., Wis.) called the guidelines a "lightning rod" for policy making. 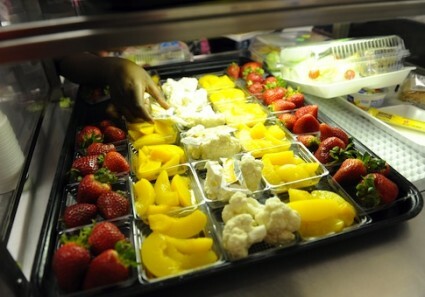 Ribble, who gave the opening remarks at the event, said he has seen evidence of misguided federal nutrition policies stemming from first lady Michelle Obama’s standards for healthier school lunches. Attending a school lunch with his 10-year-old grandson over Thanksgiving recess last year, Ribble said he witnessed the consequences of the Healthy Hunger-Free Kids Act, such as food waste. "We watched child after child after child have an empty apple core," he said. "They ate the apple and threw away pounds and pounds of fresh broccoli. It was astounding." "Almost every single plate got thrown away with the food," Ribble said. "Healthy eating has more to do with what children like and how you can help shape those tastes than it is just with some policy decision that some mom wants to make. We’d all like to have our kids eat broccoli, I know my mom wanted me to eat broccoli. I never ate it. I never liked it. I like it now as an adult, but it has to be prepared with lots of Wisconsin cheese on it." "But the point being that these discussions related to dietary guidelines are important," he said. Gunlock and the Independent Women’s Forum sent a letter to HHS Secretary Kathleen Sebelius and USDA Secretary Tom Vilsack on Tuesday expressing their concerns about "mission creep" of the committee, by focusing on "carbon footprints," "urban agriculture," and "green cleaning." The letter urged the agencies to ensure that DGAC is mission focused and transparent, and was signed by 23 other organizations, including Americans for Tax Reform, and the American Consumer Institute. "The committee seems to be reflecting ideological or political views that are out of step with the majority of Americans," said Gunlock, citing their emphasis on vegetarian diets. More than 25 percent of the panel is from Massachusetts, which only accounts for 2.1 percent of the U.S. population, Kuttner said. Troy said DGAC is abiding by the "frequent arrogance of scientists who think that they know all the answers." "The truth is that scientists don’t always have all the answers, and we have to be very careful not to make overly certain declarations or pronouncements given the available science at the time," he said. "The advice is schizophrenic," said Gunblock. "One minute you can eat eggs, and then, oh no. And I haven’t had a pat of butter in 35 years and this year I find out I can have butter again. I think people are frustrated with it, and I think there’s a natural skepticism about the guidelines." Troy also questioned whether it should be the federal government’s role to be involved in nutrition guidelines to begin with, though he doubts Congress could eliminate the advisory committee, which was first established in 1980. "The truth is, even if somehow Moses came down from Mount Sinai with another set of tablets that had the proper dietary guidelines, even if that happened I think that this process would not go away," he said. "As Ronald Reagan famously said there is nothing closer to immortality than a temporary government commission in Washington."